Kansai Osaka to Honolulu (8-hours 5-min). Basic economy on a Boeing 787-8. Passenger load on this flight appears over 90% full with almost all seats taken. Scoot uses the main KIX airport Terminal 1. The zone is easy to find and offers tall yellow signs at entrance with clear times of when check-in opens and closes. 3-hours before departure and closes 1-hour prior. The length of the economy line was significant and out into the main walkway. A long zig-zag queue system was in use for standard economy. A small side lane was for those that paid priority or booked ScootBIz that lead to a dedicated desk. It seemed an attractive product given the normal line took nearly 35-minutes from start to finish. There was a strong staff presence of Japan Airlines staff at start of queue system and end directing passengers to one of the six economy counters that were in operation. In addition, one Scoot staff is going between desks and attaching hand carry tags on bags. There is no online check-in, self-service kiosks or hand carry only system at this station. Currently Scoot only offer online check-in at Singapore and Berlin. Service at check-in was friendly by JAL. Seats are given on a random basis unless you pre-select at a fee. As luck would have it my preferred option of window seat was given to me. As normal in Japan, clear and concise instructions of the location of security, gate and boarding time. The gate for boarding is in the south satellite terminal for KIX of which requires a short monorail journey to get there. This is only a short walk after immigration. The main airside area has various tax-free shops from popular brands as well as a large Uniqlo store and some catering options but appears to be better landside than after passing security. The satellite area, where the gate is located has limited catering options with only one small coffee shop offering sandwiches and hot dogs. There are vending machines though and the odd shop but options are overall limited compared to main area. Seating though is generous and in some areas are local power sockets of which is needed given Scoot do not offer any free power availability on board, only at a charge. Boarding started on-time with a well organised systems of staggering the boarding. Ground staff display clear signs for row numbers and make checks for this in the line before the scanner. This seamless process resulted in no congestion getting on to the aircraft with local staff being polite and efficient. Customers are entitled to two pieces of hand luggage that must total a combined weight of 10kg- this was assessed at check-in and weighed. Anything over one is forced to pay for either checked baggage or an additional hand carry. For the normal allowance staff did emphasis the total must include tax-free purchases and did notice some random checks at the boarding gate. For the most basic fare there is no free checked baggage. However, Scoot offer a promotional product called FlyBagEat. This includes 20kg checked baggage allowance. Anything over or additional checked bags price is determined by the station up to a maximum bundle of 40kg, though each single bag cannot contain more than 32kg. A promotional discount of up to 30% off is indicated as an add-on when booked through the website before check-in. There is also an option to purchase an extra cabin baggage of 7kg. Prices for both are determined by the route taken and is not fixed. It is therefore cheaper to choose these options on the website during initial ticket purchase rather than at the airport which will result in an inflated price. Seating on Scoot Boeing 787-8 is arranged as 3-3-3 set up. Normal economy seating was measured at 31’ pitch and 17.3’width with a back drop recline of 5.5-inches. The recline was quite comfortable. As expected though Scoot have selected one of the most basic seat products offering no contouring with seat back completely flat and slightly firm. No personal TV and no adjustable headrest is offered. However, there is slightly more generous legroom than some other airlines (both low cost and scheduled) using this aircraft type. A firm decent sized table that moves back and forth smoothly as well as seat pocket that is wide enough to hold a small laptop or tablet due to netted stretchy design. International multi-socket power is offered between seats but is only available to passengers that pay a fee of S$7, once this is paid onboard staff turn this on. USB slot is built into the plug. Comfort on this flight length can be rough on the lower back, and I would suggest bringing a small pillow to avoid this. The main irritating aspect of this seat is the light and attendant call button remain on the top of the armrests. Resulting in constant accidental activation of lights and attendant calls going on in the cabin. It appeared to frustrate the staff especially on seats with infants as calls are continual. Scoot do offer three different upgraded seat products on this aircraft type. If one wants to choose a specific seat, rather than random selection at check-in there is a fee of 1000JPY. All bulkhead/front row seats that Scoot refer to “Stretch seats” with a claim that there is 30% more legroom offer an adjustable up/down headrest that has side wings. 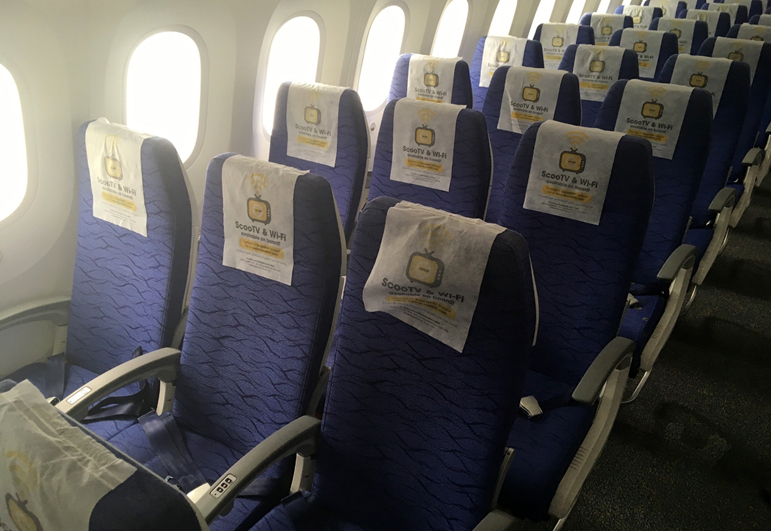 These are at the front of each cabin often referred to as emergency row seats and they charge a fee of 6400 JPY. For tall passengers, this would be a good option but did not seem popular on this particular flight. 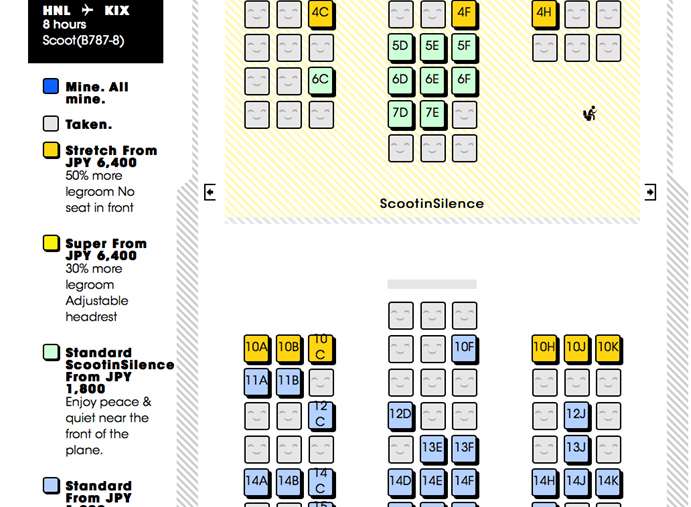 In addition, only on the Boeing 787, Scoot offer a cabin product called “ScootinSilence”. This is in the front of economy before their business product and includes 5 rows. Each of these seats offers a head rest but has the same pitch, though there is claim that bottom end of seat offers slightly more leg room. The main benefit to this product is that no children under 15 years old are allowed in this area and therefore is a dedicated quiet zone. However, there are no separating curtains so if there is a crying baby in the normal cabin behind they would be heard. Also offered at 6400 JPY and this is the same price for the bulkhead for this section. The flight left on-time and arrived ahead of schedule by 30-minutes. However, the downside being the deplaning process at Honolulu. 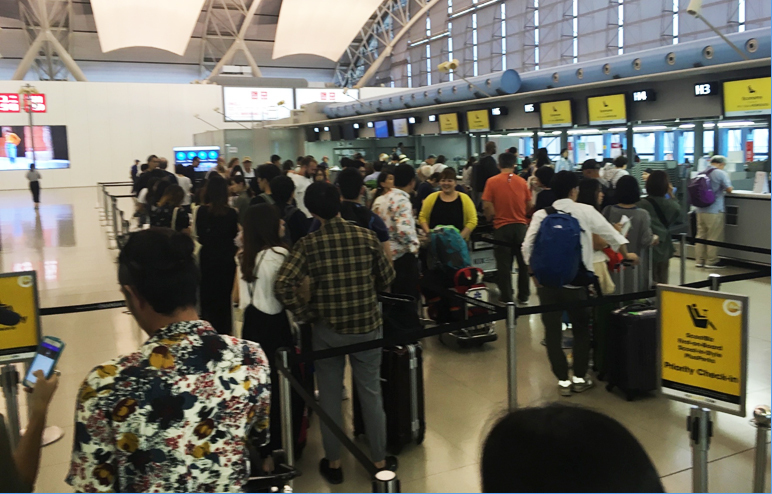 Because of terminal renovations, arrivals create long lines in airbridge as passengers are required to exit the building and be ferried by various buses to the main immigration area. This was slow moving and requires patience due to the small buses coming back and forth. Pre-ordered food is available on the website at time of booking. For the FlyBagEat fare, included is one hot meal and snack along with a choice of water or soft drink. 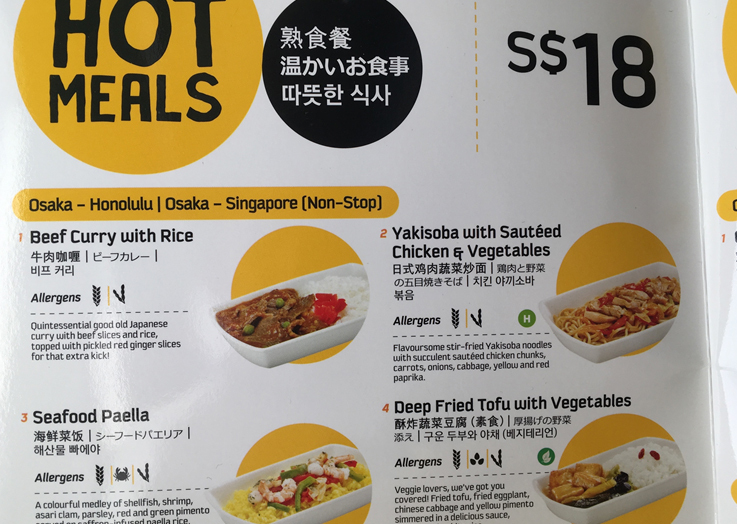 The choices of hot meal are specific to the route and these are also available onboard at a cost of S$18 as shown in the inflight catalogue on board. Pre-ordered items are the first to be delivered at 30-minutes after take-off with staff rushing them out by hand. Staff require passengers that have chosen this option to show the boarding pass. This option did not seem popular with less than 10 pre-ordered meals distributed at least in the front economy cabin. The quality of the food offered is disappointing for the price paid. Scoot do not provide any form of smart packaging and the presentation is as basic as it can get. There is only a drink option of Coke or Evian water. Delivery is with a straw (only if one has Coke) and no ice is offered, though the drink was adequately cold. The meal chosen was the beef curry and the rice seemed quite dry. The sauce was overly thick and had some skin on the top. Meat quantity was frugal. Rice was also clumpy and harder on top. One assumes it was cooked uncovered previously and re-heated, so it did not come across as fresh. However, the flavour of the sauce was acceptable. Given the price paid for a long-haul flight, this pre-ordered meal did seem small as the snack item is simply a cookie. In comparison to the same value that one would pay for a meal at Changi airport it was below standard. Tableware items were very basic, thin plastic easily breakable cutlery and small paper napkin. The main plate is also poor quality plastic, presented covered in loose and flimsy foil that is quite hot. Whilst one does not expect a tray, some effort is needed in presentation for this dining option and it was no surprise that it appeared vastly unpopular to pre-order hot meals on this flight. In comparison to AirAsia, Citilink and some other low-cost carriers in Asia – Scoot fall far behind for pre-ordered hot meals. Scoot does not allow passengers to bring any food or drink onboard and do seem overly strict if they notice this and I notice one passenger being reprimanded. To the surprise of some they do not offer any complimentary water with only option being Evian priced at S$4. This is the same price of all non-alcoholic drinks as well as hot drinks, I was told. The buy-on-board menu was not seen on this flight as it was not in the seat pocket and staff do not have any available on their cart. It is disappointing that seats are not presented with such an important item for a low-cost carrier on a long-haul flight. The buy-on-board cart follows the service of pre-ordered meals with staff rushing the cabin using a trolley. On this flight this was carried about an hour after take-off and surprisingly, there is no second service on this 8-hour flight. However, if passengers do order a cold drink from the cart they do get ice and a cup. Payment for all items appeared to be by any credit card and any major currency from the region. 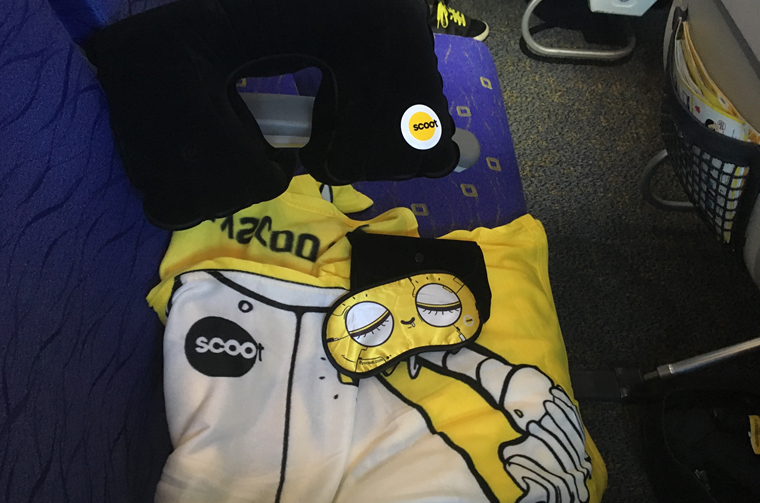 Scoot do offer a branded “Snooze” kit of which includes an inflatable neck pillow, soft eye mask and a large full-size blanket of polyester flannel material. As an add on the website this was offered per flight at 1400JPY. One does get to keep it so there is no need to buy again for the returning flight. Separately, the pillow and eye mask cost S$8 and blanket is S$15 available in their onboard sales catalogue. It was quite soft, good size and distinctively branded. Since the aircraft is quite hot, there did not appear any need to buy a blanket. Despite buying the snooze kit on the website, staff initially only present the blanket but no eye mask or neck pillow. When queried was told it only included the blanket, but later when shown the ticket purchase receipt was then presented with eye mask and pillow. It was not very efficient. There is no free entertainment on this flight and one must pre-download an app called ScooTV to stream entertainment on phones or tablets, available on both IOS and Android. This must be done before the flight, though there is no indication or promotion to do this at check-in. This is only seen on the website. According to the website and instructions located on the back of the inflight entertainment guide, this is also available on Apple and Windows laptops which can be accessed onboard through their WiFi without having to purchase. However, whilst the programme downloaded, it did not work on my MacBook as it is a later version of the operating system. Scoot need to update their system to the current versions. App streaming is charged for whole flight at a cost of 11US$ using a credit card. Once accessed the home page pre-purchase does show the remaining flight time and this is the only way to access this key information. There is no air show as shown on some streaming services. The app presents itself in English, Chinese and Japanese, which is convenient for this route. One can also access the tax-free catalogue, the buy-on-board menu and a destination guide for mostly Asian cities but not Honolulu. Basic limited information such as advice of places to eat, shop and places to visit. This can all be done before purchase of either WiFi or ScooTV. One can also view the ScooTV content as well. 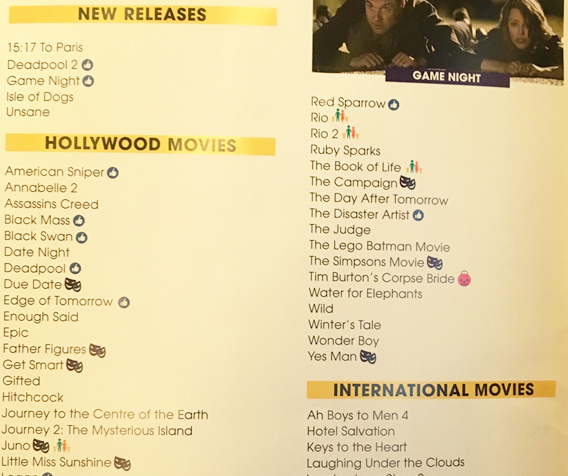 This is also shown clearly in the inflight entertainment guide found in the seat pocket. Directing around the menu was in general easy on a phone. The content is shown available as of September 2018. The TV section shows 90 programs set up in comedy and most of the titles include the first four episodes of US TV shows such as Modern Family and Young Sheldon. There is also TV drama such as This is Us and Westworld. Kids have their own menu of TV program of 6 cartoon titles and in addition is a lifestyle menu with four programs. There are no games and in general the attractiveness of this product watching from a phone was undesirable, in addition there is no option to use subtitles with Chinese already imprinted on each Hollywood movie regardless if one wants it. However, the reactivity of the streaming function worked well. WiFi is also offered on the 787 with various packages starting at 5US$ for 20mb up to 500mb at 66US$. This is from T-Mobile and worked of standard airline WiFi speed with some delay at times. 20Mb package seemed enough to check emails and social media. Scoot headphones can be purchased in the tax-free catalogue for S$19. Service during boarding on this flight felt very much unwelcoming with staff looking glum and offering no chat or smiles. Just basic directions at door as to which aisle. Staff presence is strong in the aisles for boarding, but with slightly stern faces and no pro-activity to help which given the flight was very full was much needed. The only focus was to state to passengers to place bags in overhead only and this was said quite bluntly. PA announcements on this flight were not heard clearly at all with only exception being the cockpit. The manual safety check is easily missed with not much attention for passengers to focus on it. Safety check is detailed but at time impolite with staff simply pointing to passengers and using hand signals to ask them to remove headphones. With the add on purchase of the comfort kit, that should have included the blanket, eye mask and pillow, it was a good hour after take-off without any apology for this to resolved, despite showing my proof of purchase. It seems the add-on purchase delivery is not well managed by staff onboard. 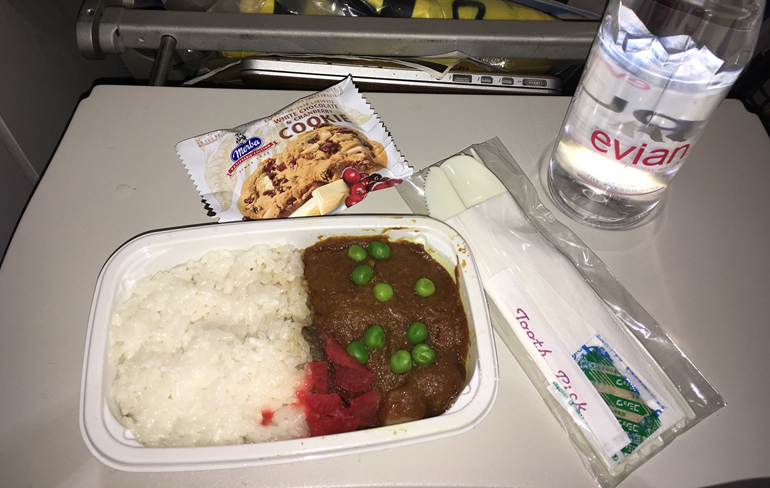 Following take-off, a very visible rushed approach by staff to hand out the pre-ordered meals without some degree of service such as offering ice with my drink or even a cup. Though seemingly if you order a drink separately from the cart, these options are presented. This bar cart service does come soon after but again they simply rush the trolley through the cabin without ensuring carefully that all passengers are aware of it, streaming through shouting drinks and food. As a result, I missed getting their attention, being at a window seat to order another drink. Collection of trash seemed to be the most fluid service with three runs after the main service but following that and into the flight, staff retire in the back gallery close curtains and are not seen again for at least 4-5 hours. Only when the frequent call buttons go off do staff appear, with an initial approach of asking passengers to turn off the button, rather than ask if one needs anything. Of course, it must be frustrating given the seat design. There is no offer of other drinks on a second cart service and when staff walk down the aisles, they, look down and avoid eye contact. Evidently it feels the overly rushed approach to service is an effort for them to seal themselves at the back galley behind curtains as soon as possible and remain there for rest of flight. The clearing runs and safety during turbulence was only strong display of staff attentiveness and presence. As well as reprimanding passengers for having their own drinks. In general Scoot staff appeared at times as if they did not really want to be there, most interactions came across as quite aloof. They were noticeably less customer focused and at times lacking attentiveness to orders as well as being evasive with issues that occurred because of their mistakes. The impression left was a disappointing effort. The cockpit was very informative on this flight, especially during bouts of turbulence showing a willingness to resolve and change flight levels. Very clear announcements and more akin to a European carrier in detail with more enthusiasm to arriving in Hawaii than the cabin crew. Arrival into HNL was ahead of schedule by 30-minutes. However, the arrival gate required a walk in then out of terminal to load on to buses. This resulted in a congested non-moving airbridge for periods of time while buses arrived. There was no indication of what baggage carousel Scoot were using and this meant looking at bags at each carousel to try and identify. However, this seems to be a result of how old HNL arrival hall is with no screens on each carousel to show this information. 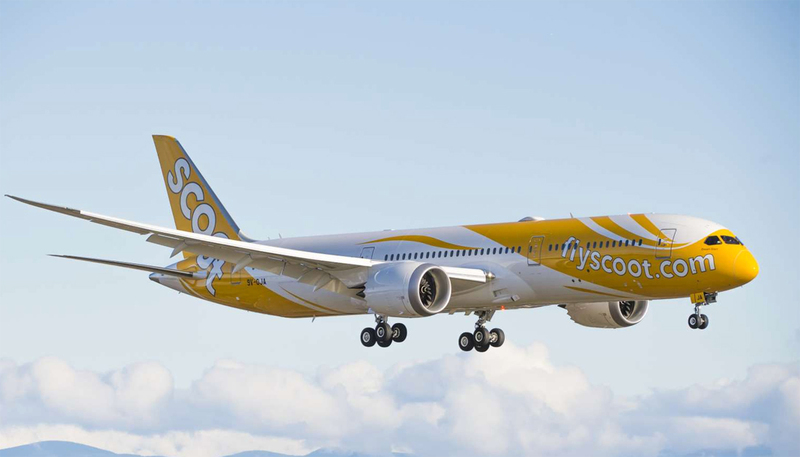 This route is heavily competitive for the Japanese market and Scoot do offer a decently priced option for passengers requiring the bare minimum of service and price. This is fine if one chooses the minimal add-ons options and expects the very minimum. However, given other low-cost carriers fly this exact same route, Scoot could do with upping the game especially when it comes to add-ons, ensuring these are worthwhile and well presented to passengers. The website also can be is slightly confusing in general and it felt that one can easily make a mistake with such ancillaries. The meal in general was of a very weak standard and overpriced. Staff do not seem that natural to customer service and attentiveness. The rushed approach to everything means the effort is indifferent to that witnessed on other low-cost carriers in the region. Scoot need to consider the efficiency and flexibility of buy-on-board as well as the presentation effort of pre-ordered items. It was clear it is not popular and was understandable from my experience. Given there is no free entertainment or power supply, the flight is boring. It feels that Scoot offer the absolute bare minimum compared to other low-cost carriers in the region and there does not seem to be much effort by Singapore Airlines to make Scoot more attractive than using other low-cost competitors. On the other hand, the ground service at Kansai was of a high standard of efficiency and well organised. The aircraft was clean and on time with no issues. Therefore, if one has no expectations other than a cheap fare from A to B that is on time then this is a good viable option.